TUCSON, Ariz. — Six junior college players will join the Arizona football team next semester after signing with the program, the school announced Wednesday. 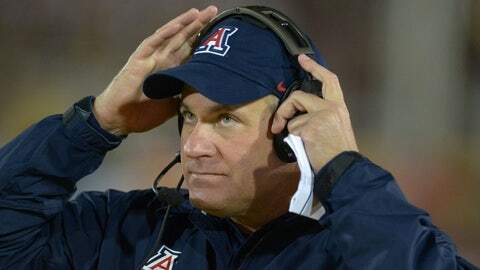 They will help with Arizona’s need to add depth at many positions. The Wildcats welcome two defensive linemen, a quarterback, a cornerback, an offensive lineman and a linebacker as part of 2014âs class of junior transfers. * Jerod Cody (6-foot-2, 280 pounds) is a defensive lineman from Glendale Community College. * Patrick Glover (6-2, 212) is a cornerback from Scottsdale Community College. * Kaige Lawrence (6-4, 280) is an offensive lineman Chaffey College (Calif.). He played at Chadron State (Neb.) in 2012. * Jerrard Randall (6-1, 190) is a quarterback Northeast Mississippi Community College. He spent two seasons at LSU before attending junior college. * Antonio Smothers (6-2, 237) is a linebacker from Scottsdale Community College. * Jeff Worthy (6-3, 290) is a defensive lineman from Santa Ana (Calif.) College. He transferred there from Boise State.